I watched Disney’s Peter Pan made in 1953 again after many years. I didn’t realize all the political incorrectness in that movie. There was blatant sexism, racism, and classism. 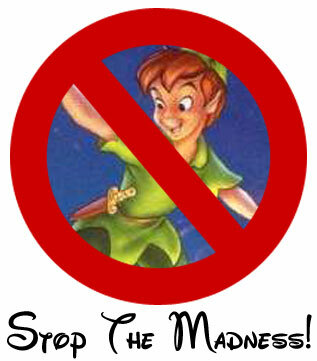 Not to mention that Tinker Bell is a stinking traitor and is not cool at all. How did she get her own pop cult? I for one don’t own and don’t want to own any of her merchandise. The sexism is in how Wendy is treated. She’s treated like dirt by her parents, a “Native American” woman, and Peter Pan. Her parents and the “Native American” woman treated her like a 2nd class citizen while they treated the boys better and allowed them to do more than her. Peter Pan acted a lot like a playa and didn’t care for Wendy very much except to be a story teller that pumped up his ego, because all her stories were about him. The Racism was in how Native Americans were portrayed and what they were called. They were called Reds and a good number of them were colored red. They also all spoke broken English, except for possibly Tiger Lily. For Classicism? For one the lost boys in their animal costumes at one point literally bowed down and worshipped Peter Pan. Also, the Darling’s family dog, Nana, was the nanny and was treated poorly on top of that. I love Disney, but this definitely wasn’t one of their best works. Not to mention that the story of Peter Pan inspires Michael Jackson, because he’s old but is still a child. Also, he named his ranch Neverland after the story. Maybe the story itself was set up to be like this, but Disney could have done something about it, but then it was the 1950s. An idealized boys fantasy where they don’t have to obey rules and where there’s danger and adventure everywhere that come in the forms of pirates and “Indians” and where there are beautiful mermaids as well.